Doctors once believed that bleeding beneath the outer layer of membranes surrounding the brain, bleeding in the retina, and brain swelling always meant that a baby had been shaken. 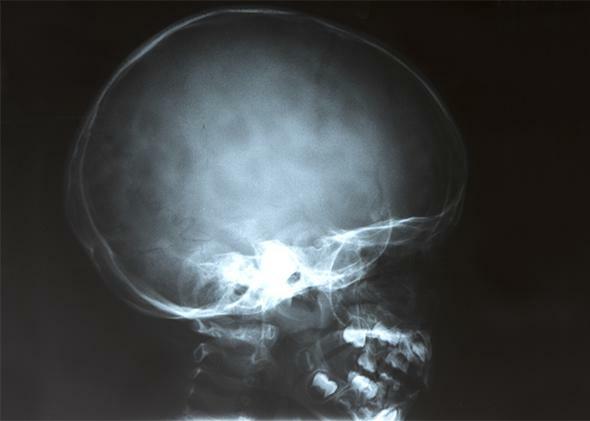 Above, an X-ray of a child’s head. Since then, a few others accused of shaking babies to death have managed to unwind their convictions. Among the exonerated is Drayton Witt, an Arizona father whose conviction for the murder of his 4-month-old son came undone in 2012 partly because the medical examiner recanted his testimony—after Witt had served a full decade in prison. Expert review of the medical records uncovered a plausible cause of the baby’s death. It appeared that the infant, who had experienced seizures throughout his life, died from an ongoing disease, one that led to a kind of stroke. Shirley Smith, a California grandmother, received clemency from Gov. Jerry Brown in another SBS case. Smith was helping raise her daughter’s 7-week-old infant when he died in the middle of the night. The baby didn’t have the standard triad of symptoms—just “minimal” subdural bleeding. That makes Smith’s case an outlier. Still, she was convicted in 1996 and spent a decade in prison before she was released by an appeals court. Brown later commuted her sentence to the time she had already served, citing “significant doubts” about her guilt. Del Prete’s upcoming release from prison is crucially different from the cases of Witt, Smith, and Edmunds. Witt and Smith prevailed, but because of the less typical nature of their cases, no court expressly questioned the SBS diagnosis. In Edmunds’ case, the state court was concerned about what it viewed as a “legitimate and significant dispute” about the cause of the baby’s symptoms. But the judges stopped there. Now for the first time, a federal judge has condemned the standard SBS diagnosis itself. The prospect that Del Prete was wrongly incarcerated, while her children grew into adulthood, is profoundly troubling. But her case highlights problems that transcend her own tragedy—gross dysfunction in our criminal justice system. While Del Prete’s conviction is evidently unraveling, others just like it remain untouched. That can’t be right. Perhaps hundreds of inmates—people like Beverly Moore and Alma Calderaro—sit in prison because the mere presence of the triad of SBS symptoms was once assumed to prove their guilt. We have no mechanism in place for revisiting a category of flawed convictions. Our criminal justice system is too primed to stay the course. One hope for these cases lies within prosecutors’ offices, which are beginning to create “post-conviction integrity units” dedicated to righting wrongful convictions. New York County and Dallas County have had such units for years, and now other offices are following suit. This past month alone, district attorneys in Philadelphia and Cleveland each added a section devoted to exonerating the innocent, and Brooklyn District Attorney Kenneth Thompson announced that Harvard law professor Ronald Sullivan would become the chief of another conviction review unit that will work with an independent panel of attorneys.